2018 - The Year to Buy Big-Ticket Items? Big expenditures in hunting and fishing tend to be rare for most people. For the most part, the outdoors has always been a rather humble sport, available to all in some form regardless of social status or financial means. Growing up, squirrel hunting economics were driven by the best deal you could get on a brick of .22 ammo. Trout and panfish didn’t seem as picky as they are now and crawlers were free to pick. Even deer hunting was done with a hand-me-down Bear with poorly fletched aluminum 2117’s that flew just as crooked as they were bent. Today, we spend more on that which we enjoy, and I don’t think that’s necessarily a bad thing. Gear and gizmos that expand the experience or otherwise make for a more enjoyable outing aren’t taboo in my mind, provided they don’t determine the pleasure you take away from doing what you love. The trick for almost all of us is always getting the most for your buck, and doing without until the time is right. Given what I’m seeing in all aspects of the outdoors industry, that time may be now or at least very soon for big-ticket purchases. I’m talking about the many-hundred or multi-thousand dollar ones. Boats, fish-houses, trailers, and even rifles or bows. While I’m not involved in the day-to-day operations of all categories of outdoors manufacturing, it doesn’t take somebody plugged-in to know that the world is looking to be more expensive for years to come. Here’s just a few of the indicators and reasons why. Anything metal from deerstands to augers like this Strikemaster 40V will be more expensive by this time next season. Raw goods and materials costs rise over time, and tariffs are at least in the short-term, influencing prices of steel and aluminum. That is not an indictment on anyone or a political stance; it’s a material reality that makers of anything metal are facing right now. When their costs go up, yours will inevitably creep upwards as well, the degree to which depends on timing, inventory, and a host of other variables that are more difficult to predict. While these source materials may drive the largest portion of future increases, there’s other factors at play as well. Consumer buying behavior has also changed from what we’ve come to know over the past few decades, even the past few years. The brick and mortar retail market has contracted somewhat, and online sales have shifted business models for retailers everywhere. Amazon and other internet power players have aided in an overall loss of retail floor space, and in-turn our local hunting and fishing re-supply efforts have changed as well. With consolidation comes a lack of choices, and typically increased cost of all products. Many goods that ship well or are relatively low-cost will always be somewhat price-protected, but larger, more expensive items you’d likely want to see in person before buying will still need to live in the retail spaces we’ve always purchased from. Even those that buy shotguns, ice augers, or fishing electronics online have likely spent some time in person with that product, whether out with a buddy or in taking the time to stop by an industry show or sport shop. Especially with larger items, service provided by retailers is still vital to the help that consumers need with those products. These days you can buy anything anywhere, but not knowing how, when, or why to use it defeats the purpose of purchasing it in the first place. There’s also the fact that things don’t always work as advertised and may require additional work or maintenance that keeps people happy with shops that do a good job. That said, even though your average hunter or angler may be buying at an independent retailer or other local store for whatever level of service they provide, the product itself is not immune to price increases due to overall market consolidation. Lastly and perhaps most importantly is the topic of financing a large purchase. We live in a time where borrowing money is extremely cheap, especially compared to previous decades. Especially in boats and fish-houses, financing options will play a big role for customers everywhere. With recent indications that the Federal Reserve Bank may increase its benchmark borrowing rate several times in the next few years, you’re likely to pay higher interest on any large item you finance moving into the future. All of which is not a cry to dig up the coffee can in the yard and throw your money at a large hunting or fishing purchase! I will however, make no hesitation in saying that if you are buying in the foreseeable future, you’ll likely pay more the longer you wait. It’s true that no one can fully predict the future here, and markets are fickle, with complex factors at play which can always reverse trends. Not to mention, often the best time to buy something big is simple. Do it when you’re ready. I grew up next to two “cricks,” one of them being closer to a trickle, the other maybe more appropriately named a creek. The two eventually joined, but no matter where we fished along them, the experienced was a hands-on activity. Worms were dug, grasshoppers were caught, and most of the fishing involved wading and an eventual swim. It’s rewarding to see my boys enjoying the same parts of the crick that I did, as they dig some bait and head down to fish for whatever bites. Most times, the quarry is simply a good time. Meaning they drown some angle-worms they found in the compost pile, catch whatever array of stream minnow species they can find, and eventually find the deepest hole to jump in. It doesn’t always happen in that order, especially when the burning nettles rake across uncovered skin, or the weather is plain hot and buggy. Then the swim usually happens first, and fishing upstream happens next on account of all the muddy water running downstream. Other times yet we’re after trout and the whole game is more serious. We’re looking to make the perfect cast on a 45-degree angle upstream, as current washes our spinners along a grass undercut or current seam. Most of our success comes incidentally while fishing for chubs and such, but there’s times where we catch a few trout actually trying to. I’ve yet to show my oldest son Isaac how to raise the biggest browns during the day, covering ground and marking holes, only to come back during low light to catch them. Mostly that’s because with trout especially, I think you have to walk before you run, as the slightest mis-step, bad cast, or wrong movement can end your chances for that specific hole. Especially if the water is running clear. Of course much of the fun are the adventures, stories, and days happenings that I hear from my kids when they head down to the crick themselves. A few days ago, I had to visit a specific spot on the streambank to verify that there wasn’t a black bear in the area. Instead, it was a few deer that stood near each other to drink in perfect alignment. As their hooves splayed symmetrically side by side, the mud looked as if marked by claws. Dating back to my own youth, we’ve had run-ins with skunks, mad geese, even some upset beavers. Perhaps the scariest was during the snapping turtle mating season, or so I was told, when we waded a small section to fish a deep hole below us. Upon climbing up the bank to leave, we turned back to see two garbage-can-lid sized snappers, locked together shell to shell in a prehistoric embrace. They were rolling in the river exactly where we were standing, probably too preoccupied to care what we were up to. It was spooky nonetheless, especially to my kids. Probably what I enjoy about the crick more than anything is the simplicity of the fishing and self-reliance it requires. Bad casts are typically rewarded with a free cool-down as the offender wades to retrieve the lure. Deep snags or anything unsafely dislodged means you’re intentionally breaking the line and learning how to tie knots. A cast in the weeds means everyone ducks and is glad they were wearing eye protection. All these lessons from a simple cast. While not as challenging to catch as the trout, I’ve seen chubs, river shiners, and simple suckers reduce grown men to near tears as they fumble with micro jigs as mosquitos, tall weeds, and steep banks mess with them. These minnows don’t live just anywhere along the streambank, they’re focused on outside turns, current seams, woody cover, and undercut banks like the trout are. Reading water for me started as a kid both fishing and wading through areas that held these minnow species. In those days, the small crick wasn’t a trout stream, so we were legal to seine minnows, something my own kids love to do as well. They actually prefer the crayfish, taking turns to see who gets pinched first, daring one another to put one on their nose and the like. It’s funny that later in life as a college student, many of my fisheries courses went back to wading in similar rivers trying to find those same species of minnows. We were stream naturalists without even knowing it, learning as we went, at times even finding freshwater lampreys. Of course, we had no idea what they were at the time, but spent some hours looking through old encyclopedias until we came across a similar looking sea lamprey. These days, the answers to so many of those questions we once had on what bug is this, or what minnow is that comes at the tips of our fingers. Still, the process of uncovering something brand new to us at the time, then following the path of research to understanding is just as fun now as it was then. Exploring the natural world around us is a great excuse to get out and do some crick fishing, if for nothing else but to get out and enjoy the outdoors. Just make sure to wear long pants until it’s time to swim. I’ve been trying to figure out the best way to write about a recent trip I had to Northern Wisconsin, where I caught zero fish, and had an absolute blast doing it. I know, it sounds odd stated like that. Sunset and scenery pics must mean the fishing was poor right? Amidst the pressure of always trying to stay on top of the bite, I’ll be the first to admit that fishing can be tough no matter who you are, or how much experience you have. But this bite, wasn’t really even a bite, and I wouldn’t describe anything I did that day as “tough.” It was my birthday, and though I’ve been making it a practice of always wetting a line each year on that day, work took me to Hayward, WI for a meeting. That was fine by me, as the drive was beautiful, and it gave me a chance to scout a few spots for the return trip. Where I would fish, for how long, or where I’d end up was anyone’s guess, and I was satisfied to let the day take me wherever it led. That alone is refreshing in today’s day and age of chock-full online calendars and commitments. I didn’t have a boat hooked on back, no fancy electronics, scores of rods, or hundreds of pounds of tackle. I had a small travel rod and a single river box I’d put together. Staples from jigs and plastics to #5 Shad Raps, and a few terminal tackle pieces. It would likely be tough to find fish, trying places I’d never been before along the Namekagon, and small lakes I’d seen dotted along my route. Heck, I wasn’t even targeting a specific species, I was just casting to cast half the time. Explorer fishing, without a plan or purpose, really suited me that day. I started along a river, watching canoers plunge through some rapids as I fished back-eddies and current seams from my shoreline perch. Poor planning and overall ambivalence to the days fishing plans left me without proper footwear or clothing to even get in and wade, so I was fine with creeping down back-trails and sneaking wherever was dry. As the well-worn lanes narrowed to paths, and eventually just game trails, I was lured further by the thought that maybe, just maybe, no one has ventured this far in years, and I’d come to a miraculous pool of unfettered smallmouth just around the next bend. No such pool was around the corner, but I did see a number of smallies blowing up on dragon-flies. They didn’t like what few topwater options I had in my river-box, but it sure was fun to try. Next stop was a river bridge with too much current, and the one after revealed too much shallow water for my liking. I was looking for something in between, but fishing new places always involves some strikeouts. Like the next two spots, which were just boat landings that had some small gills and crappies visible from the dock, but nothing going elsewhere. This kind of fishing is about checking on new leads too, so I headed north and off my route home to a lake rumored to have some gargantuan gills from this past winter. I found the lake, and even fished it from shore a bit, looking for any sign that might confirm or deny their presence. Another miss, and time for a break, so I stopped at a small corner bar near the lake to see if I could chat up any locals. Aside from the bartender who’d heard that “there’s fish in there” but had no idea as to the size or speciation, there was only an old man sitting at a picnic table. He offered only vast generalities, and a bit of red-herring to throw any self-respecting angler like myself off the trail. That said, he did lament the fact that the lake at one-time had a fishable walleye population, at least until “somebody probably caught two of them and called everyone they knew.” I suspect he was talking about the bluegill bite in code, but it was fun sharing a birthday beer with him somewhere in the middle of Wisconsin nonetheless. I pointed the car towards home, tempted to think poorly of the overall fish-count from the day, and disappointed at first that I hadn’t brought the boat, made a call to some friends in WI, or otherwise just prepared better for my excursion. But I had a great day, and really enjoyed the break from constantly being “on-point.” I fished casually, enjoying the pursuit without letting it dominate the day. I didn’t cast gruelingly till last-light as mosquitos feasted on my blood-smeared face, grimacing in focus for the next heroic fish-hoisting moment. I flicked a few ticks off me and just fished, then drove home. Anti-climactic, perhaps, but it’s been the best fishing trip I’ve had this year. Boat – Fishing from shore can have its advantages for the after-work-angler, as a boat can actually be the number one deterrent to hitting the water in short order. That is especially true if you have been neglecting some messes. Whether it be simply storing your tackle and gear away, or anything from trailer light issues to nagging motor problems, having the boat in tip-top shape well beforehand keeps you from walking past it in the morning and throwing in the towel. That’s why the best guides I know do their rigging and boat prep the night before, or well in advance of when they’ll be using their boat. It is amazing how much a well-cleaned and clutter-free boat wants to be hooked up to the truck more often. Non-Essential Fishing Items – Too many short trips are bogged down by non-essential items like bait, the latest lures you want to throw, or even all of your rods. If you approach it from the standpoint of any fishing is better than no-fishing, your world is colored a bit differently. Sure, there will always be some bites that require specific gear, tactics, and styles of equipment to help you be more successful, but if you only have two hours to wet a line, you probably will not need 3 or 4 patterns worth of bait, tackle, rod/reel, and line setups ready to roll. Keep the staples on hand and be ready to fish. Supplies - On nights like these, time is the one commodity you cannot compensate for. That means that chock-full gas tanks, supper, ice-cold beverages, or sometimes-even snacks are things that can wait. If you are with kids, add snacks and drinks to the mix for sure, but do your best to limit the luxury items and especially stops if you can help it. I’ve been the guy that stops to top off the tank, then grabs a bite to eat, only to forget ice and drinks; putting me on the lake with about an hour to fish. That is a letdown no matter what you are fishing for and how dialed-in the bite is. Plan – I do my best to have a plan when I hit the water no matter how much time I have to fish, but that could be even more important when the sun is diving. If it is a lake I have never fished before, I have two spots I’d love to hit in detail, and I study the contours to develop a mental plan of action. Knowing the lake or river you fish certainly helps, but it can also hurt. A similar plan of attack is best should you fall prey to “fishing a memory” and hanging in that location far too long. 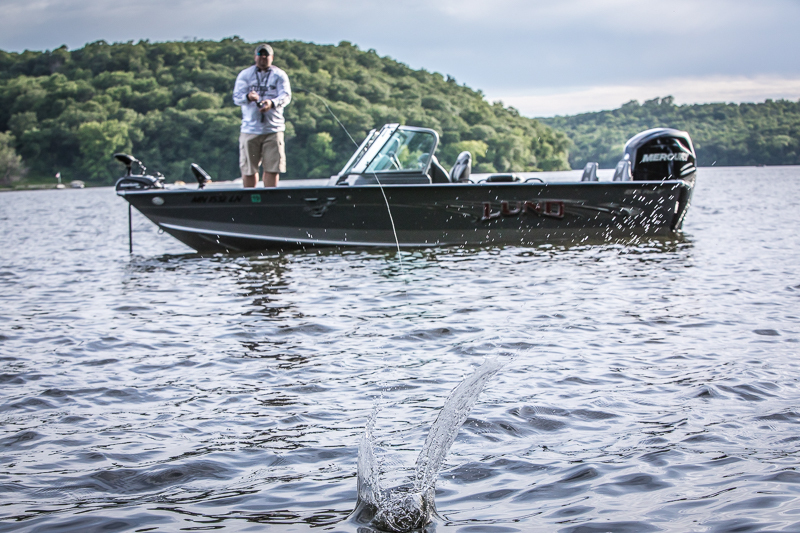 Spend more time on different locations, being vigilant to hit even more spots in an effort to find fish quickly. On the Water - From a fishing perspective when I do hit the water, I am looking to do only one or two things that I will live or die by. Personal experience, time of year, or other local knowledge certainly helps, but you can also turn it into an information gathering session or experimental bite night. These short fishes can be the best way to dabble in new techniques or spots, giving you the confidence it takes to give it half or a whole day’s attention later. Whatever you choose, do your best not to switch back and forth to too many different techniques or you’ll spend more time rigging than fishing. Sometimes power fishing methods of trolling or active casting can be the best way to catch active fish and cover water in a short amount of time, and take that into account if you’re thinking about bobbering, rigging, or picking apart areas that can drain the clock. So do your prep ahead of time, have that boat ready, and keep in mind that there’s few things you’ll actually NEED once you slide off the trailer and into the water. Have a plan but keep it a simple one, such that you spend more time casting the summer away, rather than once again regretting its passing. Increasingly, our entire world is becoming wireless, from speakers that can order a pizza by simply asking for one, to Smart Home thermostat devices that can detect your presence to crank up the A/C a bit. While some may argue to leave these modern amenities onshore, there’s no doubt that increasingly, such technologies are following us onto the lake. If information is ammunition, we’re better supplied these days than ever before. While most of the focus is on GPS/Sonar units at the dash of the boat, increasingly we’re tying more and more options into them. Here’s just a few ways that digital connectivity is providing more successful outings. Software updates are a part of life these days, even with our smart-phones. The same is true for bug-fixes and fish-finder updates that can be done through your phone. These updates can fix glitches or improve functionality of your graph, so it’s best to be running with the latest and greatest. The last update I did on my boat electronics was actually through Wi-Fi, where I used my phone as a mobile hotspot, connected to that hotspot via my on-dash graph, and then downloaded the file directly into the boat. From there, a simple “open” box allowed me to run the update, and after a quick re-start I was running the freshest version of software available. Previously, we would have to take the graph to your desktop and connect via cables, or transfer via an SD card. Now, I’m able to do the same thing from the lake provided I have a good cell signal. Most of the major GPS/Sonar manufacturers are offering “networked” options between your on-dash graph and other digital options in the boat, but why would you want it? Networking your fish-finders together does cost more money, as these are typically upgrades from a standard setup, but they can result in an overall cost savings and ultimately prevent you from running back and forth from the cockpit to the bow to see what’s on each screen. Ethernet cables and routing boxes help both the bow and dash fish-finders to communicate with one another, and that’s valuable in many other ways as well. Some units can share cartography, negating the need to purchase a map chip for each unit, while others will share screen-shots, or even side-imaging views from the main dash unit thus allowing you to purchase a more economy model without side-imaging for the bow of the boat. Fishing information, as well as other files and even music can be shared wirelessly or via auxiliary/USB cables to your on-board command center, making todays electronics far more than just a fish-finder. Digital contour maps are increasingly a major part of our fishing, as we strive to interpret underwater structure that may hold more fish. You can rely on map-chips for that information, or you can purchase the Navionics App to view contours and your location on top of them directly from your phone. This can be handy in a friend’s boat or when the App contours are more updated than the source you’re using. Of course, you can also create your own high-resolution contours with the aid of specialized software that pairs with your GPS sonar to record locations, depths, and even bottom hardness. That information is interpolated and processed onto a map card for your later use, and can always be updated with more passes across the same location and better information. Technologically-improved boat control is probably the #1 way that new gadgets can up your catch-rate, and that happens through a number of ways. 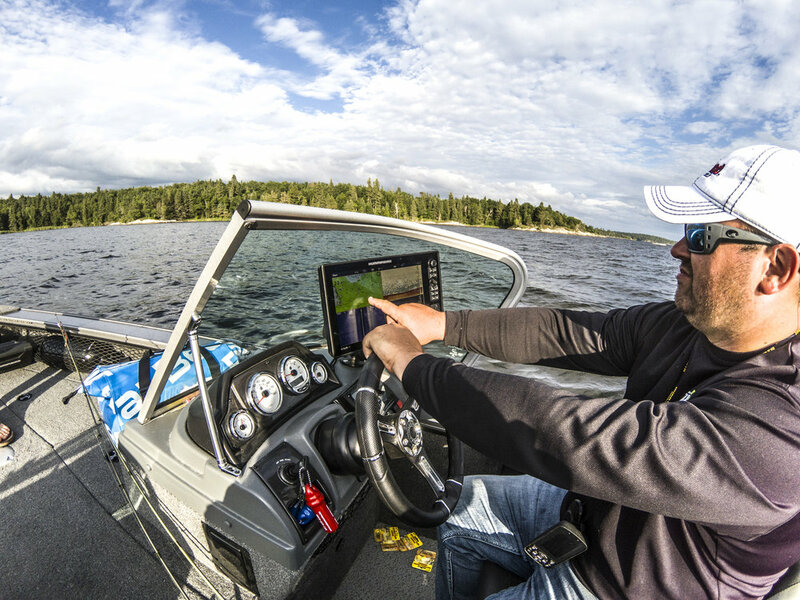 Information sharing continues to trolling motor options, allowing on-screen control of everything from speed and direction, to navigation from anywhere in the boat to shared waypoints. Networking your trolling motor then to the rest of your electronics allows for a simple, one-stop location from which to control multiple functions. These can include anything from digitally anchoring (via “Spot-Lock” on the trolling motor) on a GPS location, to automatically deploying a telescoping rod into the lake bottom that pegs you in place, all from your command center at the driver’s seat of your boat. We have had wireless trolling motor controls for some time, but they are becoming less linked to your input via button pressing, and more directly tied to mapping, cardinal directions you pre-determine, or existing waypoints and routes. More hands-free operation allows us to re-create a successful trolling run, continue down a specific contour at a certain heading, and casually spot-lock along the way should something be working well at a specific location. At the end of the day, wireless connectivity means doing more things that used to take two-arms and a leg in an automated, no-hands fashion. This frees us up to do more fishing, all while keeping our boat over fish and heading in a productive direction. While I’ll always have respect for, and enjoy an old-school back-troller locking the corner of the boat against a stiff wind along a fish-holding weed line, I’ll also look for ways to enjoy fishing more. If this floats your boat, then more power to you, but remember to be kind to the resource along the way.